﻿ Matthew 6:5 "When you pray, you are not to be like the hypocrites; for they love to stand and pray in the synagogues and on the street corners so that they may be seen by men Truly I say to you, they have their reward in full. "When you pray, you are not to be like the hypocrites; for they love to stand and pray in the synagogues and on the street corners so that they may be seen by men Truly I say to you, they have their reward in full. "Whenever you pray, you must not be like the hypocrites, because they love to pray standing in the synagogues and on the street corners to be seen by people. I assure you: They've got their reward! "And whenever you pray, don't be like the hypocrites who love to stand in the synagogues and on the street corners so that they will be seen by people. I tell all of you with certainty, they have their full reward! And when thou pray, thou shall not be as the hypocrites, because they love to pray having stood in the synagogues and in the corners of the thoroughfares, so that they may be seen by men. Truly I say to you, they have their reward. And when ye pray, ye shall not be as the hypocrites: for they love to stand and pray in the synagogues and in the corners of the streets, that they may be seen of men. Verily I say unto you, They have received their reward. "And when you pray, do not be like the hypocrites who love to stand and pray in the synagogues and on street corners [i.e., in prominent view of everyone] in order to be seen [and praised] by people. And when you pray, you shall not be like the hypocrites; for they love to pray standing in the synagogues, and in the corners of the streets, that they may be seen by men. Verily, I say to you, They have their reward. And when you make your prayers, be not like the false-hearted men, who take pleasure in getting up and saying their prayers in the Synagogues and at the street turnings so that they may be seen by men. Truly I say to you, They have their reward. 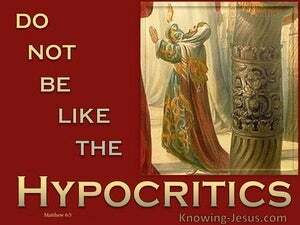 "And when you pray, you shall not be like the hypocrites. For they love to pray standing in the synagogues and on the street corners, that they may be seen by men. Truly, I say to you, they have received their reward. And when you pray, be not as the hypocrites are: for they chuse to stand praying in publick places, and at the corners of the streets, to be observ'd by men. I assure you, they have their reward. And when you pray, be not like the hypocrites: because they love to pray standing in the synagogues and in the corners of the streets, in order that they may appear unto the people. Truly I say unto you, They exhaust their reward. "When you pray, you must not be like the hypocrites, for they like to pray standing in the synagogues and in the corners of the squares, to let people see them. I tell you, that is the only reward they will get! And when thou prayest, thou shall not be as the hypocrites; for they love to pray, standing in the synagogues, and in the corners of the streets, that they may appear to men: verily I say unto you, they have their reward. And when thou prayest, thou shalt not be as the hypocrites are, for they love to pray standing in the synagogues and in the corners of the streets that they may be seen of men. Verily I say unto you, They already have their reward. And when thou prayest, thou shalt not be as the hypocrites; for they love in the assemblies, and in the corners of the broad ways to stand praying, so that they might appear to men. Verily I say to you, that they have their reward. And when you pray, you shall not be as the hypocrites are: for they love to pray standing in the synagogues and in the corners of the streets, that they may be seen of men. Verily I say unto you, They have their reward. And whenever you pray, do not be like the hypocrites, because they love to stand [and] pray in the synagogues and on the corners of the streets, in order that they may be seen by people. Truly I say to you, they have received their reward in full! 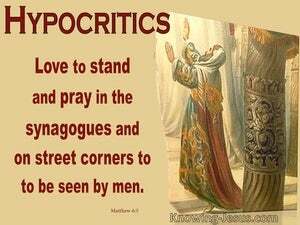 And when you pray, you shall not be like the hypocrites. For they love to pray standing in the synagogues and in the corners of the streets, so that they may be seen by men. Truly I say to you, They have their reward. And when thou prayest, thou shalt not be as the hypocrites are: for they love to stand and pray in the synagogues, and in the corners of the streets, because they would be seen of men. Verily I say unto you, they have their reward. Also, when you pray, you must not be like the hypocrites, for they like to stand and pray in the synagogues and at the street-corners, so as to be seen by men; I tell you truly, they do get their reward. "And whenever you pray, do not be like the hypocrites. For they love to stand and pray in the synagogues and on the corners of the avenues, in order that men may see them. In solemn truth I tell you that they have their reward in full. 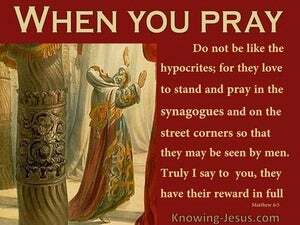 "Whenever you pray, do not be like the hypocrites, because they love to pray while standing in synagogues and on street corners so that people can see them. Truly I say to you, they have their reward. "And when you pray, you shall not be as the hypocrites, for they love to stand and pray in the synagogues and in the corners of the streets, that they may be seen by others. Truly, I tell you, they have received their reward. And when ye pray, ye shall not be as the hypocrites are; for they love to pray standing in the synagogues and in the corners of the streets, that they may be seen by men. Truly do I say to you, They have received their reward. And when you pray, be not like the hypocrites; for they love to pray standing in the synagogues, and at the corners of the streets, that they may be seen by men. I tell you truly, they have their reward. And, when ye may be praying, ye shall not be as the hypocrites, because they love, in the synagogues, and at the corners of the broad ways, to take their stand and pray, that they may shine before men; Verily, I say unto you, they are getting back their reward. And when thou prayest, be not as the hypocrites: for they love standing in the synagogues and at the corners of the streets, to pray, that they may make a shew to men. Verily I say unto you, That they have their reward. And, when you pray, you are not to behave as hypocrites do. They like to pray standing in the Synagogues and at the corners of the streets, that they may be seen by men. There, I tell you, is their reward! And when thou prayest, thou shalt not be as the hypocrites are: for they love to pray standing in the synagogues, and in the corners of the streets, that they may be seen by men. Verily, I say to you, they have their reward. "And when praying, you must not be like the hypocrites. They are fond of standing and praying in the synagogues or at the corners of the wider streets, in order that men may see them. I solemnly tell you that they already have their reward. "Also, whenever you pray, you must not be like the hypocrites, for they love to pray standing in the synagogues and on the street corners, to attract the attention of people. I solemnly say to you, they already have their reward. "When you pray, you shall not be as the hypocrites, for they love to stand and pray in the synagogues and in the corners of the streets, that they may be seen by men. Most certainly, I tell you, they have received their reward. "And, when ye pray, ye shall not be as the hypocrites; for they love to pray, standing in the synagogues and in the corners of the streets, that they may be seen by men: verily I say to you, they have their reward. And when thou prayest, be not like the hypocrites; for they love to pray in public assemblies, and in the corners of the streets, that they may be taken notice of by men. Verily I say unto you, they have their reward. And when thou mayest pray, thou shalt not be as the hypocrites, because they love in the synagogues, and in the corners of the broad places -- standing -- to pray, that they may be seen of men; verily I say to you, that they have their reward. 4 so that your giving will be in secret; and your Father who sees what is done in secret will reward you. 5 "When you pray, you are not to be like the hypocrites; for they love to stand and pray in the synagogues and on the street corners so that they may be seen by men Truly I say to you, they have their reward in full. 6 "But you, when you pray, go into your inner room, close your door and pray to your Father who is in secret, and your Father who sees what is done in secret will reward you. "Whenever you fast, do not put on a gloomy face as the hypocrites do, for they neglect their appearance so that they will be noticed by men when they are fasting Truly I say to you, they have their reward in full.